Facts about Dung Beetle, "Scientific name for Dung Beetle is Phanaeus vindex". Dung beetles get their name for their diet: animal dung or feces. They are part of the Scarabaeoidea family. There are two sub-families of dung beetles, Scarabaeinae and Aphodiinae. Scarab beetles, revered by the Egyptians, are part of the Scarabaeidae family. It has been said that the world would quickly go to crap without Dung Beetles, since they are almost the only creature in many ecosystems that regularly disposes of dung. Some species of dung beetles can roll up and then bury 250 times their own weight in dung per day, which is why the world isn’t drowning in animal poop. Dung beetles are found on every continent except Antarctica. They are found in every ecosystem, from forests to grasslands to deserts. The Dung Beetle aren’t found in the far north of Siberia or North America, though they are found along the Alaskan coast and Atlantic seaboard of Canada. They aren’t found in Greenland. Dung beetles fly around looking for fresh dung, particularly that of large herbivores. Yes, they will hover around waiting for an elephant to poop. Some of the smaller species actually ride on the herbivore waiting for a load to drop. Others will use their sense of smell to find fresh dung. Some Dung Beetles will eat the dung of omnivores. Primarily, they are eating the partially digested matter in the poop like the woody portions of plants that weren’t fully digested by the herbivore. Dung beetle adults will drink liquids from the dung. Larva will stick to the liquids in the dung that they can find. Dung beetles don’t just eat dung. Some species can eat decaying leaves, fallen fruit and mushrooms. Deltochilum valgum is a rare exception, feeding on millipedes. 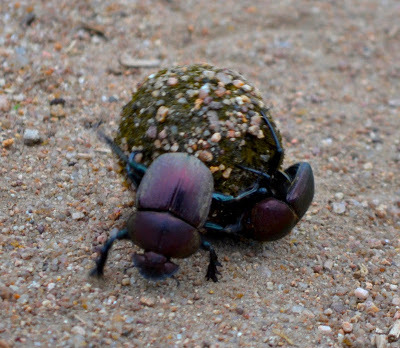 Dung beetles are classified based on how they handle the poop. Rollers roll animal dung into balls in which to lay their eggs. Males try to build a big ball in order to impress a female; if she accepts, they roll away the ball together to a chosen location. Then they bury the ball to protect the young, unless they choose to eat the dung themselves. Some species of Dung Beetles leave the ball and larva at this point to start anew, while others stay to protect the larva. Tunnelers land on the manure and tunnel into the large load. They tunnel through the poop and down into the ground. They then line the tunnel with poop to save it as food and reinforce the walls. Tunneling dung beetle species stay with the eggs they lay in the tunnel and then protect the larva for the three to four months it takes them to mature. Only bees and termites and a few other insect species put that much care of their young. Dweller dung beetles simply land on the poop, eat it at their leisure, lay their eggs and raise that brood on that one poop patty. The adults may move on to a newer, fresher patty to eat while the larva are found in the drying pats. The Dung Beetle is unique in that it was scientifically proven to align itself by the light of the Milky Way for navigation. One African dung beetle species navigates by the polarization of moonlight. Dung beetles are known for rolling the dung in a straight line regardless of the obstacles or terrain, but until the 2013 study, there was no definite proof of how they managed that feat at night.